(Catalpa, Northern (Catalpa speciosa) - 01) The northern catalpa has smaller and more upright flower clusters than the common catalpa, which is mostly a southern tree. 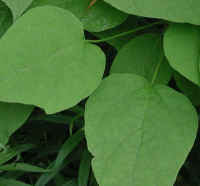 The leaves of the northern catalpa are generally heart shaped and can grow to slightly over 12 inches in length. (Catalpa, Northern (Catalpa speciosa) - 01a) Sometimes the leaves of the northern catalpa have lobes, as do the two that are in the upper left of the photo. 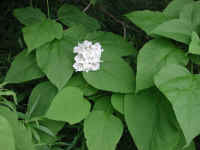 (Catalpa, Northern (Catalpa speciosa) - 01b) As with these two examples, the leaf notches or lobes of the northern catalpa do not always occur near the stem end of the leaf. 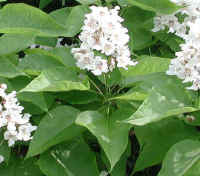 (Catalpa, Northern (Catalpa speciosa) - 02) The showy flower clusters of the northern catalpa bloom May and June, after the leaves have developed. The actual size of each flower is about 2 inches across. (Catalpa, Northern (Catalpa speciosa) - 03) The flowers of the northern catalpa are tubular and have frilly edges on their petals. 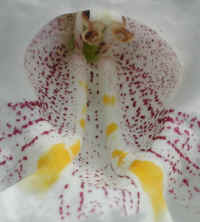 The lower petals have yellow and purple spots which generally form in lines. The spotting of each flower appears to be unique, much like human finger prints. (Catalpa, Northern (Catalpa speciosa) - 04) This northern catalpa tree is in full bloom. The characteristic pyramidal shaped flower clusters are evident only in the center of the photo. The others are irregular. (Catalpa, Northern (Catalpa speciosa) - 04a) In this photo of the northern catalpa, we can see the characteristically long stems on the leaves and the way they grow opposite to one another or are whorled. 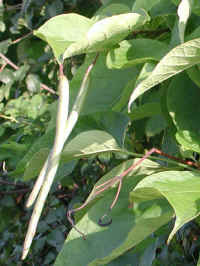 The flower stocks grow from the leaf axils. 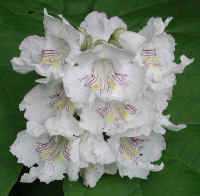 (Catalpa, Northern (Catalpa speciosa) - 05) This is another photo of a portion of a northern catalpa tree in bloom. 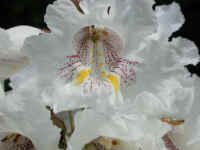 (Catalpa, Northern (Catalpa speciosa) - 06) This is another close-up look at a two inch northern catalpa flower. (Catalpa, Northern (Catalpa speciosa) - 06a) In this bee's eye view of the center of a northern catalpa flower, we can see the stamens and pistil, and the yellow and purple spotting. 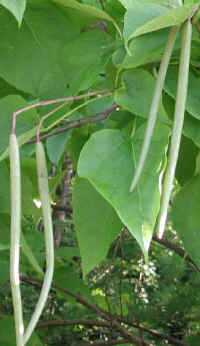 Each flower is capable of producing a bean-shaped seed capsule. (Catalpa, Northern (Catalpa speciosa) - 07) The flowers have fallen off the northern catalpa, and the seed pods (beans) have begun to develop. It's hard to determine exactly how many of the flowers developed seed pods, but it appears that only 15-20% have produced pods. Note the color of the seed pods. (Catalpa, Northern (Catalpa speciosa) - 08) In this closer look at a developing northern catalpa seed pod, we can see the longitudinal striation. (Catalpa, Northern (Catalpa speciosa) - 09) In this closer look at a developing northern catalpa seed pod, we can see the longitudinal striation. (Catalpa, Northern (Catalpa speciosa) - 10) This photo shows two of the maturing seed pods, and in the lower center of the photo is a small curved seed pod that stopped developing. 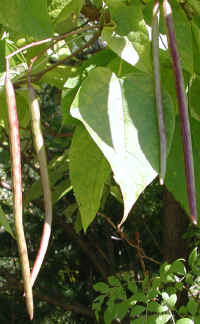 Fully matured seed pods can be 1.5 feet in length. (Catalpa, Northern (Catalpa speciosa) - 11) As the seed pods of the northern catalpa continue to mature, they continue to darken in color. (Catalpa, Northern (Catalpa speciosa) - 11a) If we look at the branch to the left of the northern catalpa seed pod, we can see examples of the two ways the leaves develop from the branch. 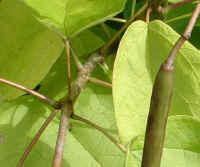 The four leaf stems nearest the bottom of the photo have developed in a whorl, while the two above are simply opposite one another, and above that there appears to be another whorl. (Catalpa, Northern (Catalpa speciosa) - 12) Note how the purple color in the seed pod of the northern catalpa begins to dominate as the pod nears full maturity. If you look closely at the upturned leaf near the bottom of the seed pod, you can see the fuzzy texture, which is another characteristic of the northern catalpa. (Catalpa, Northern (Catalpa speciosa) - 13) The seed pods on this northern catalpa continue to ripen. (Catalpa, Northern (Catalpa speciosa) - 14) These northern catalpa seed pods are in differing stages of maturity. 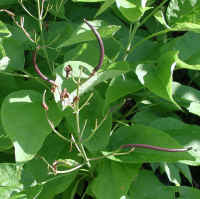 The less mature pods have more green color compared to the deep purple of the fully mature pods. (Catalpa, Northern (Catalpa speciosa) - 15) During the warm days of Spring, the northern catalpa begins to sprout new leaves and begin its annual cycle once again. 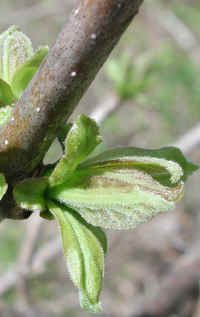 (Catalpa, Northern (Catalpa speciosa) - 15a) In this photo we have a closer look at some of the newly sprouting leaves of the northern catalpa. (Catalpa, Northern (Catalpa speciosa) - 15b) In this photo we can see many of the details of the bark of a northern catalpa tree branch, and more of the newly sprouting leaves. 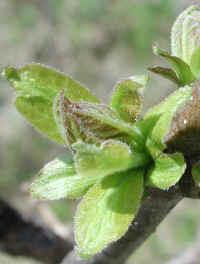 (Catalpa, Northern (Catalpa speciosa) - 16) This is another photo of the newly sprouting leaves of the northern catalpa. Note also that the leaf clusters sprout opposite one another, or sometimes in groups of three, as can be seen in photo 15. (Catalpa, Northern (Catalpa speciosa) - 16a) This is a closer look at a leaf sprout of a northern catalpa, in which we can see the details of the underside of a leaf. 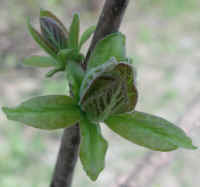 Notice that the leaf is comprised mostly of veins at this stage of its growth. 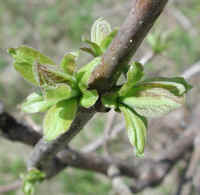 As the leaf matures the veins will grow in length and new cell growth will occur between the veins; there will not be any more major veins than those present in this leaf. 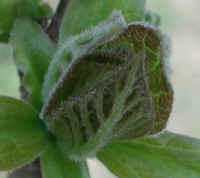 Compare this "baby leaf" structure to the mature leaves in the other photos, particularly the underside of the leaf at the bottom of photo 12.